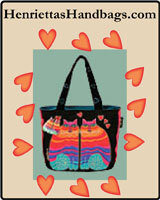 The Mini Tote and Indie Shopper Bag Patterns by Mackerilla have instructions for 2 bag patterns that are easy to make and can be used for shopping, as a lunch bag, a grocery bag, or as a handbag! 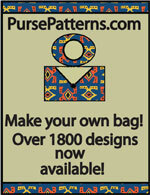 This tote pattern has instructions for 2 bag patterns: a mini tote with a finished dimension of 10"H x 6"W x 6"D and a shopper pattern with a finished dimension of 11"H x 14"W x 6"D. Each bag is easy to sew and are suitable for the beginner as well as the more advanced seamstress. Make as gifts or use for a lunch bag, shopping bag, small grocery bag, handbag, or book bag. Thanks to the lovely model, Oonagh, who is a rescue dog! 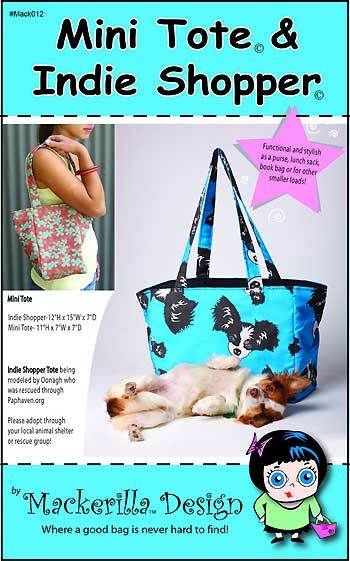 This PDF pattern has a total of 7 pages and has instructions for 2 different sized tote patterns. There is 1 cover page and 6 pages of instructions and illustrations.